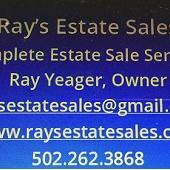 Ray's Estate Sales is an estate sale company serving the Louisville, KY area. Entire Home Estate Sale Over 2500 sq. ft.
50% OFF Entire Home & Garage Client wants it all GONE!!! Lake Forest Estate Sales Over 7500 Sq. ft.
Lake Forest Huge Sale over 5000sq. ft.
Lake Forest Over 4260 Sq. Ft.
Estate Sale includes Everything and the House!!! This company has posted a total of 48 estate sales. Only the most recent 47 sales are shown.